Bird Removal | Birds in Vents | Westchester, NY. One of the more common calls for our wildlife removal specialists is bird control. Don’t let Birds start building nests in your attic. Birds in the vents or home is a problem that should be dealt with quickly. 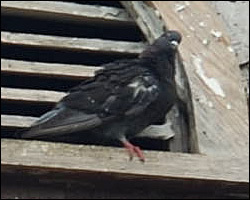 Some of the more popular birds that can become a nuisance are pigeons, sparrows, starlings, crows, geese, and seagulls. A QualiltyPro bird control specialist can help you in removing these pest birds and provide you with exclusion to keep them out of your home or business. There are a number of different ways of performing bird removal. A bird control expert can help you with the best method of getting birds out of your home. We can help you with bird removal and relocation. We can also perform bird exclusion, which will prevent birds from being able to gain access to your home again. Bird exclusion is one of the best ways of preventing any future bird problems in your home or business. There are a number of bird problems in Westchester, Bronx, Rockland, Putnam Counties and Greenwich, CT, that can be created as birds build nests in your vents or home. Birds can transmit a number of diseases to humans and animals through their droppings. Birds can also carry lice and mites. Once removed from your home, it is best to have the area disinfected to ensure that there are no lingering potential health risks. To have your bird problem taken care of sooner rather than later, call us today! (914) 712-6333 Put our experience in bat control to use for you!